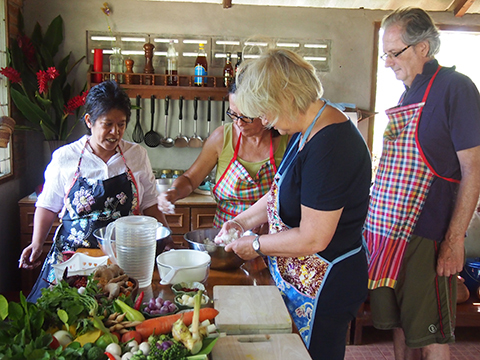 Come to Mina’s cooking class and learn how to prepare delicious Thai dishes from an extensive list of recipes. The fun atmosphere and friendly staff will make the cooking experience unforgettable. Each student will have their own station and ingredients to prepare the dishes. 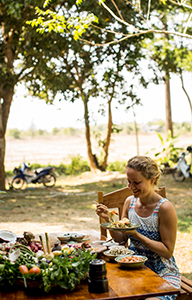 After the class we will sit and enjoy the fruits of your labor in a traditional Thai way. Come and take one of Mina’s wildly popular couple’s classes! Enjoy your privacy on a special occasion, such as a honeymoon or a birthday with Mina. Choose your favorite dishes and she will show you how to create a meal you won’t forget! Bring a date and have fun learning and cooking, because the most delicious food is cooked when you are cooking it together! Looking to inspire your child’s culinary creativity? Children are always welcome at Mina’s spacious and beautiful garden. 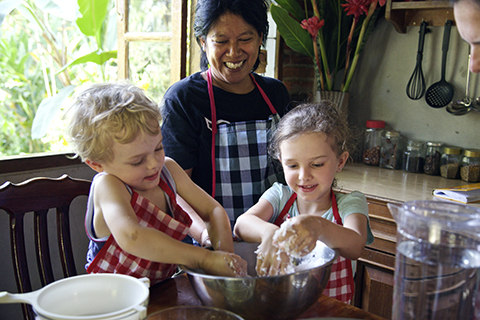 Share your love of cooking with your children by giving them a culinary experience of traditional Thai cuisine they’ll never forget! The recipes for children are fun and easy to make. • Free taxi transfer from/to Koyao Noi hotel or piers, The Paradise resort and Krabi pick up from/to Takao pier, Koh Yao Yai Island and Phuket pick up from/to Manoh pier. * Every course has a minimum of 2 people. * Shared course: the menu will be a mix of your and others' requests, therefore we cannot guarantee your preferenced dishes. Nevertheless, each participant can choose one of their favorite dishes. * Private and family course: Guarantee of all your preferenced dishes. * If you are only 1 person, please check with us before. * We cook one course per one time, maximum 3 main courses or starters + 1 dessert + 1 drink. * You can swap dishes from different sets of menus. No additional charge if you cancel or modifiy 1 day or more before your class. For cancellations or modification made less than 1 day before the class date, the cost of total price will be charged.